Home / Home Slider / Which Crufts or Scruffts category would your dog win? While shopping a couple of weeks ago, something which I hadn’t been looking for caught my eye. 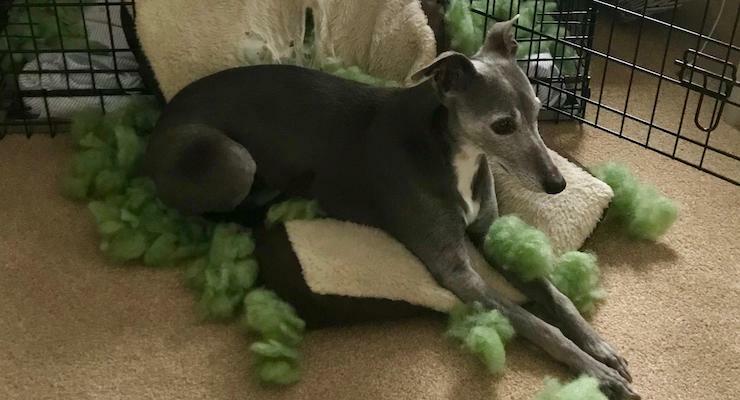 My husband and daughter had been campaigning for a new dog bed for our whippet, Bluebell. I’d resisted, as she’s scratched through every single bed she’s ever had. She disinters the padding and it lies in fluffy piles on the floor around her selection of beds, until I clear it up. But this dog bed didn’t look like a dog bed. Rectangular, with a cover of faded blues and greys, it was almost pretty, in a shabby chic kind of way. It looked a bit like a fancy scatter cushion. So, impulsively, I bought it. But, sure enough, two weeks later she’d already scratched through the fabric and started pulling out the bed’s innards, despite its pleasing colours. So when James Wellbeloved invited me to imagine a Crufts or Scruffts category which my dog would win, I knew the answer. Founded in 1891, Crufts is the world’s largest dog show. The Kennel Club’s annual canine celebration sees thousands of dogs competing, and the top prize is the title of Best in Show. Crufts competitions are for pedigree breeds, but the event also features Scruffts, which is for crossbreeds. Crufts categories include Jumping, Agility and, my favourite (because it’s hilarious and should more accurately be called Dancing With Your Dog), Heelwork to Music. Scruffts contests include Most Handsome Dog, Child’s Best Friend and Golden Oldie. 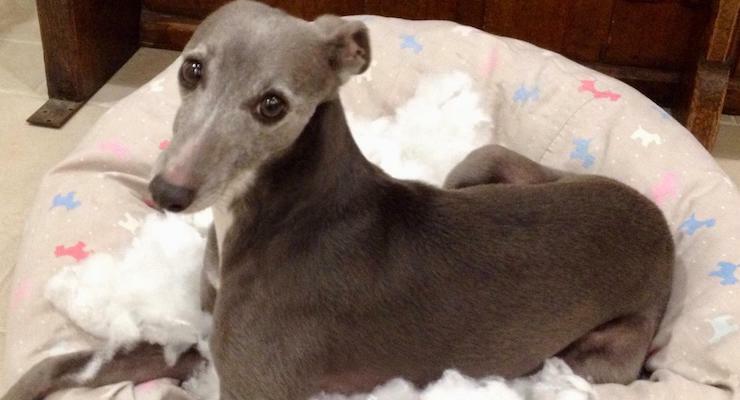 Last year we watched the Crufts final on TV, and we were very excited when a beautiful whippet, named Tease, won the Best in Show prize. When choosing a winner, dog show judges look at the animals’ health, condition, movement and temperament, as well as comparing them to the official Breed Standard. Tease must have scored top marks in all areas. 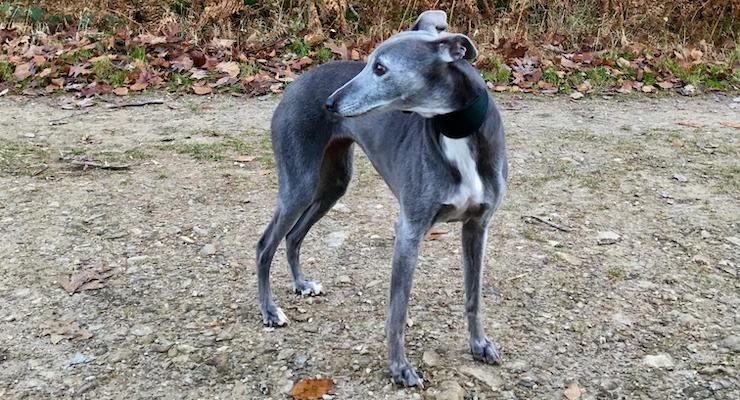 As gorgeous as she is, our Bluebell would have no chance of winning a prize at Crufts, as she’s too small (her height measures 43 cms and the female whippet Breed Standard is 44-47 cms). Also, although she’s gentle, friendly and affectionate, she’s very nervous of other dogs, so her temperament probably wouldn’t be up to Kennel Club standards either. As for training, we did take her to puppy training classes but she kind of did her own thing there, and she was definitely bottom of the training class. When it comes to health and condition though, I think Bluebell would get top marks. We’re always very careful about what we feed her, as she has quite a sensitive stomach and many types of dog food just don’t suit her. At one point we were even cooking chicken and vegetables for her to eat. So when I was asked to write this post, I said that I’d need Bluebell to try out some James Wellbeloved food first. I bought a bag of their dry grain free dog food from our local pet shop. Along with meat, this food contains vegetables, instead of cereals, and it has no artificial preservatives. Bluebell really likes this food, and it seems to agree with her, so I’ll definitely be buying more of it. Having thought about her strengths and personality, I’ve decided that the dog show category which Bluebell would definitely win is Best Bed Hoarder. Thanks to a combination of her destructive approach, my reluctance to throw anything away which could still be useful, and my husband’s desire for her to have a decent bed, Bluebell’s managed to amass a total of eight dog beds. She only actually needs two beds: one for home and a smaller one for travelling in the car (she sometimes comes on trips with us). The beds are scattered around our house, some piled on top of each other, all waiting for her to grace them with her presence. 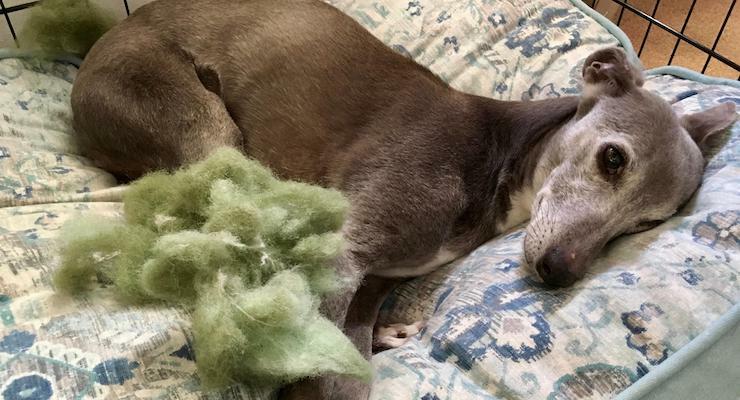 Ironically, she spends more time snuggling on a sofa or a bed with one of us than she does lying on any dog bed – so perhaps, rather than hoarding beds, her ultimate goal is in fact to dispense with the need for dog beds altogether. *Disclosure: This post is sponsored by James Wellbeloved, but all opinions, words and images are my own. James Wellbeloved sponsor both Crufts and Scruffts.